Rupa mane is a highly motivated and dynamic real estate agent of the eastern suburbs of Melbourne. 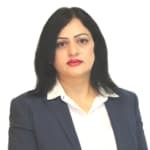 With over a decade of sales and customer service experience, Rupa is renowned for her impeccable work ethics and warm nature. She treats everybody the way she would like to be treated. Rupa enjoys building long term relationships with her clients by consistently keeping in touch with them and offering them her utmost attention, enthusiasm and professionalism they deserve. Rupa Mane doesn’t currently have any sold properties on Homely.